People of West Nirmar Alirajpur & Jhabua district of Madhya Pradesh celebrates Mass Swayamvar(Marriage Ceremony) for couples who are looking for true Love. Heaven for those who believe in love marriages or you can say Tribal Valentine's Day. 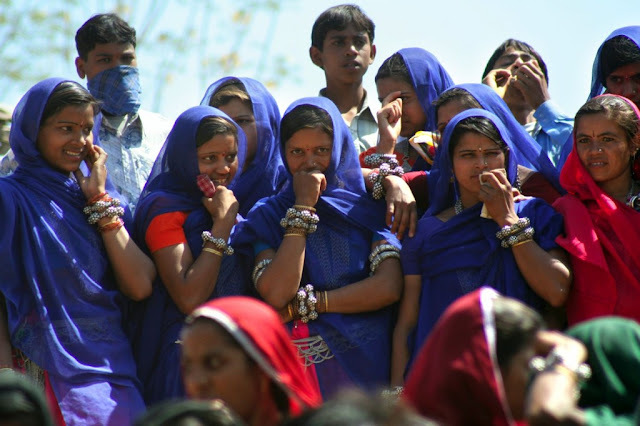 Bhagoria Festival or Bhagoria Haat(Mela) is the multi-hued festival of the Bhil's and the Bhilala's tribes of Madhya Pradesh. This is a festival of Colour, Music & Love. The Bhagoria Fest usually held a week before the Hindu festival of colours, Holi. Men and women celebrate it with traditional dancing to the beat of drums and thalis and the melodious voice of shehnai and bansuri (flutes). Bhagoradev or the god of dance is worshipped on this juncture. The most respected village elder or Sarpanch supervises over the ceremony and offers sweet meals to the god. Festival name itself indicates its purpose ‘bhag’ means ‘to run’ - after choosing their partners, the young people elope and are subsequently accepted as husband and wife by society through predetermined customs. During the Bhagoria Haat or Mela, the boys put Gulal (red/pink powder) on the face of the girl to whom he wants to get married, if the girl too willing to marry the same boy, she has to put the same Gulal (red/pink powder) on the boy's face after which both of them run away from that place and if not, she wipes it off and walks away. But if the girl does not get convinced in the first instance, the boy can go behind her to sway her and may win her heart. This may not happen immediately but the boy may pursue her and succeed eventually. Usually the couple may have met before the fair several times, and hence the idea of eloping is rather a formalized process, more stylistic than real, and conforming to the laws of their traditional rules and regulations. Bhagoria festival is celebrated in the month of Phalguna (February – March) seven days before Holi, the major Indian festival. Earlier, the Bhagoria Haat was also the place for settling old disputes; open invitations were sent to enemies for a fight in the haat. Bloody battles used to be quite common in the past but today police and administration do not allow people to go to the haat armed. The Bhagoria haat also coincides with the completion of harvesting, adding to it the dimension of being an agricultural festival as well. 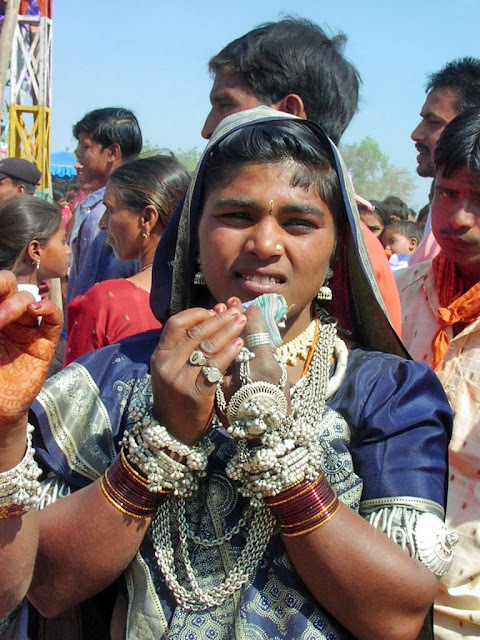 During this festival, young tribal girls and boys dress up in colorful clothes and big and traditional silver jewelry which one does not see in everyday markets. Each group wears a matching set of clothes which helps them stand out in the crowd. The groups of boys enter the arena dancing and playing instruments like the flute and other such instruments to create attention of females toward them. This festival is full of dance and songs and drunken revelry. The tribes make homemade alcohol drinks called ‘tadi’ (Local wine) made from the fruits of the mahuaa tree. 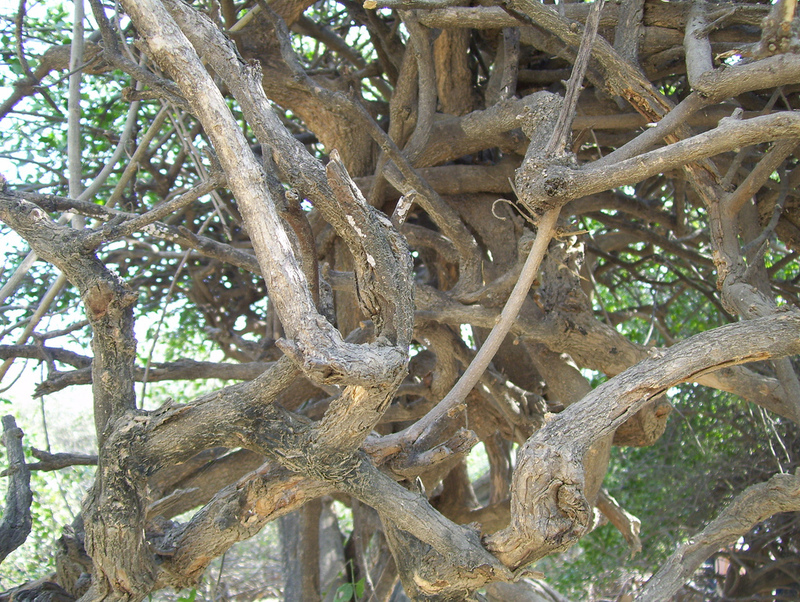 The fruits of this tree are dried and fermented creating a local brewed alcohol which is enjoyed by the entire tribe. Tadi is a famous rural alcoholic drink of India. Alirajpur is placed at Khandwa - Baroda State highway number 26 . The Distance of Alirajpur is 150km from Vadodra, 48 kilometers from Kukshi (Dhar) and 85 KM form Jhabua. Road is very good to reach here from every side. 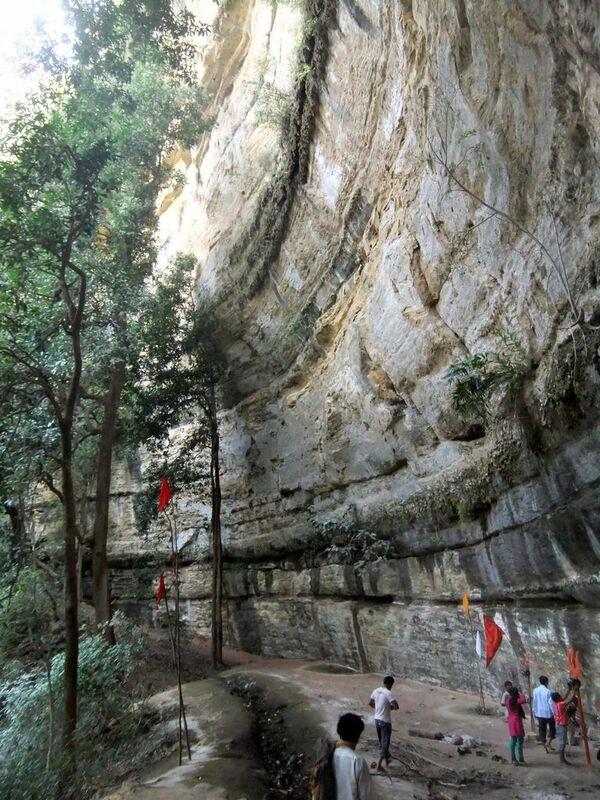 It is Located 250 kms away from Indore and also with several direct buses available from there. Nearest Railway Stations are Dahod, Megh Nagar and Chota Udaipur and the nearest Airport is at Vadodra, Indore, Bhopal & Jabalpur. Visit in any month of the year but especially for Katthiwada waterfall visit in rainy season From July to November month and to enjoy Bhagoria festival visit 1 week before Holi in the month of March. There are some Rest Houses of PWD and Forest Department and many private Hotels. 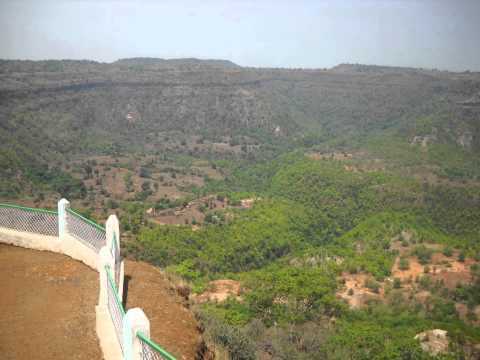 At one end, forest of Katthiwada (known as mini Kashmir) and at the other end greenery over the mountain at Mathvad area in sondwa block As well as the view of Narmada river with heavy flow of water and boating .Besides of these there are an ancient temple of Goddess "Malwai" Mata, Jain Holy place "Lakshamani" and many places of historical importance. All of us must have celebrated Holi - the very joyful, energetic and religious festival of India, people celebrate Holi with dry colours, coloured solution, the means to fill and spray others with coloured solution (pichkaris), water balloons filled with coloured water, and other creative means to colour their targets. Holi - Popularly known as ‘Phagwah’ in Assam, ‘Dol jatra’ in West Bengal and ‘Fagu’ in Nepal, Holi is celebrated with different names and traditions across India. But what if we tell u that there is a village in Mathura district, Barsana (also known as Brahmasaran, Barsana Dham or Varsana) where people play Holi with wooden sticks. This unique type of Holi famously known here as “Lath Mar Holi” or “Braj KI Holi”. ‘Lath’ means Bamboo stick (staff) and ‘Mar’ means Hit – Hitting with Lathi’s. 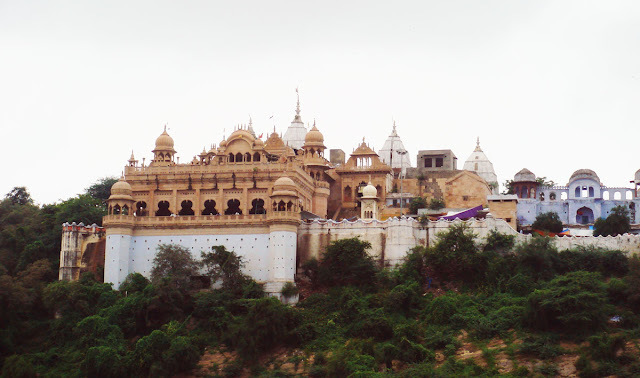 Barsana lies on a slope of ridge. Holi of Barsana-the birthplace of Radha, a village 40 kms away from Mathura, is of particular interest. Here, men from Nandgaon-the birth place of Lord Krishna, come to play Holi with the girls of Barsana and hope of raising their flag over Shri Radhikaji's temple. But, instead of colours they are greeted with sticks by the gopis. Hence, the Holi get its new name here Lathmar Holi (A Braj way of celebrating Holi). Lathmar Holi takes place around a week before the main day of Holi. The next day, it is the turn of men of Barsana. They reciprocate by invading Nandgaon and drench the womenfolk of Nandgaon in colours of kesudo, naturally occurring orange-red dye and palash. Today, the women of Nandgaon beat the invaders from Barsana. It is a colourful site. As per Hindu mythology Lord Krishna visited his beloved Radha's village on this day and playfully teased her and her friends. It is said that Lord Krishna being dark in complexion and Radha being fair, Lord Krishna applied color to her face. Thus began the festival of colors, Holi. 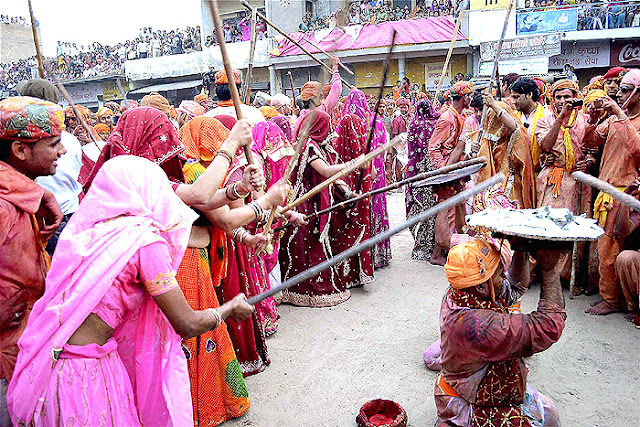 The women of Barsana took offence and chased Lord Krishna and his friends away by running after them with lathis (Bamboo Sticks). Men and Women of Braj even today clash in a colorful display of battle of the sexes. Men of Nandagaon raid Barsana with the hopes of raising their flag over Shri Radhikaji's temple. 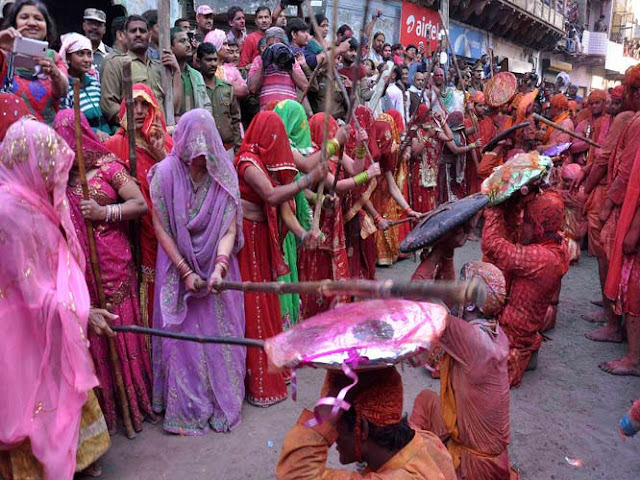 They receive a thunderous welcome as the women of Barsana greet them with long wooden sticks (staff). The men are soundly beaten with Lathi’s as they attempt to rush through town to reach the relative safety of Shri Radhikaji's temple. Smart enough, men come fully padded as they are fully aware what kind of welcome awaits them and also the fact that they are not allowed to retaliate on that day. In this mock battle the men try their best not to be captured. The unlucky ones are forcefully led away and get a good thrashing from the women. Further, they are made to wear female attire and dance in public in the spirit of Holi. All this takes place in the sprawling campus of the RadhaRani or LadliJi temple, the only temple of RadhikaJI in India. One of the other delights of this festival is a drink called thandai (भांग), During intervals, participants sip 'thandai', a cold drink that is sometime intoxicating because it is laced with a paste called 'bhang' made of cannabis, almonds, fennel seeds, saffron, milk, sugar and cardamom. Bhang and Holi go together. After drinking bhang, people react in different ways, some crave for sweets, and others cry or laugh. It is an ecstatic experience, which is heightened by the revelry. It is a great way to de-stress and bond. Lathmar Holi is a day where the normal routine is broken. This village is settled on and around two hills which are adjacent to each other. The white colored hill is the longer one and is called Brahma Hill while the black colored one is called Vishnu Hill. Padma Purana states that Lord Brahma has taken the form of these hills in Barsana so as to get the dust of the lotus feet of Shri Shri Radha Krishna and Their devotees on his heads. There are four peaks of these hills- Bhangarh, Maangarh, Daangarh and Vilasgarh and each of these peaks is one of the heads of Lord Brahma. 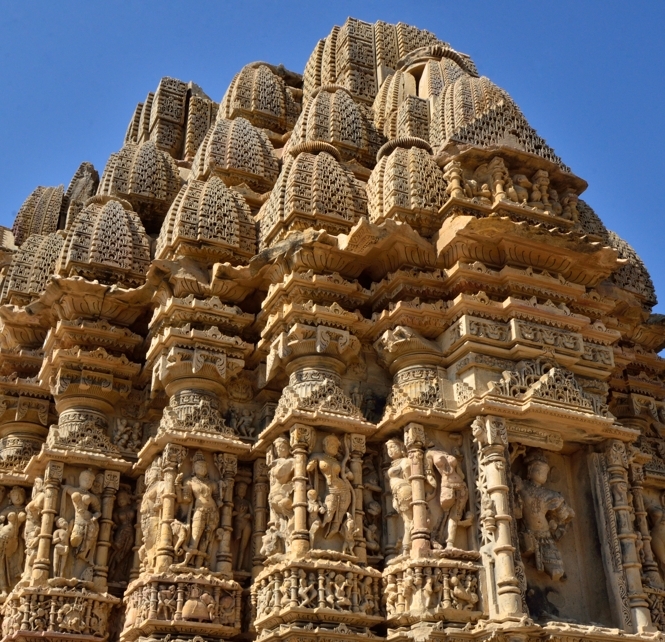 Vilasgarh lies on the Vishnu Hill while the rest three peaks lie on Brahma Hill. There are two legends associated with Holi. Originally, Indians celebrate this festival to commemorate the departure of winter and the beginning of the new season of spring, which brings good harvest. The other legend according to Hindu mythology is that of the death of Holika, the sister of Hiranyakashipu – the King of Demons. According to this legend, Hiranyakashipu was granted a unique boon by Brahma after a long penance. The boon made the King of Demons invincible, specifying that he cannot be killed during day or night; inside the home or outside, not on earth or in the sky; neither by a man nor an animal; neither by astra nor by any shastra(Weapons). The king soon compelled people of his kingdom to worship him alone. 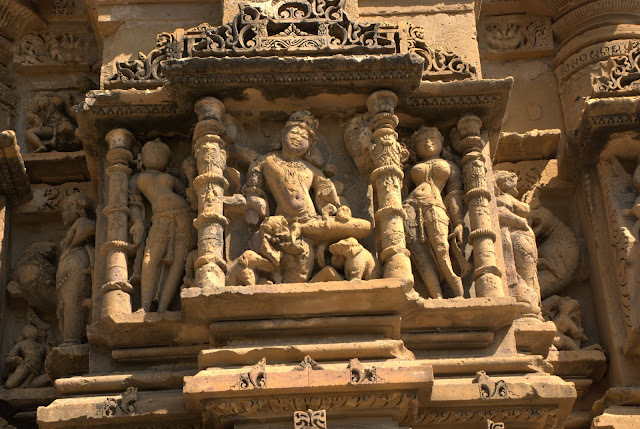 It was his own son Prahlada- a devotee of Lord Vishnu- who rebelled against him. Seeing this, the arrogant king ordered his own son to be killed. Despite Hiranyakashipu’s endless threats and warnings, Prahlada continued to offer his prayers to Lord Vishnu. Hiranyakashipu tried to kill Prahlada many times – poisoned his food, made elephants walk over him but nothing could harm the little boy. The king then went a step ahead and locked his son in a room full of poisonous snakes. But yet again, he failed in his attempt. 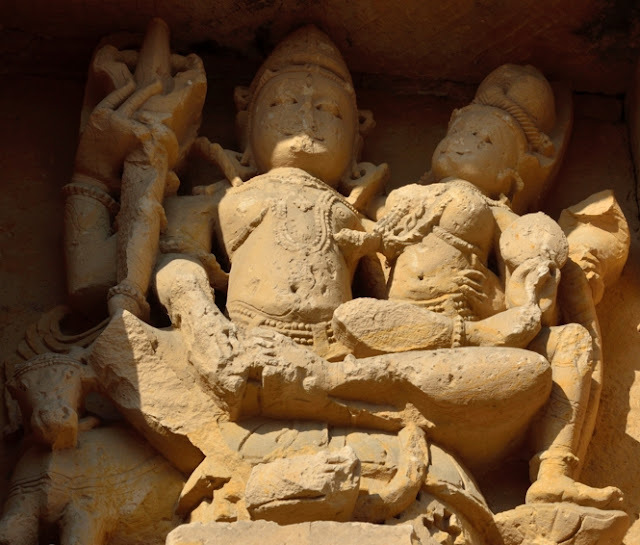 When all his efforts failed, Hiranyakashipu ordered Prahlada to sit on a pyre with his sister Holika, who was gifted with a boon that prevented her from getting burnt. The obedient boy readily agreed to his father’s command. As he sat on his aunt Holika’s lap, he started praying to Lord Vishnu for his safety. The Almighty’s blessings saved Prahalada while Holika was burnt to death, thereby surprising one and all. The death of Holika symbolizes the end of evil. And hence, people across the nation celebrate Holi with utmost fervour, by using myriad colours, to celebrate the victory of good over evil. Also, Holi is not a one day festival as celebrated in most of the states in India, but it is celebrated for three days. Day 1 – On full moon day (Holi Purnima) colored powder and water are arranged in small brass pots on a thali. The celebration begins with the eldest male member who sprinkles color on the members of his family. 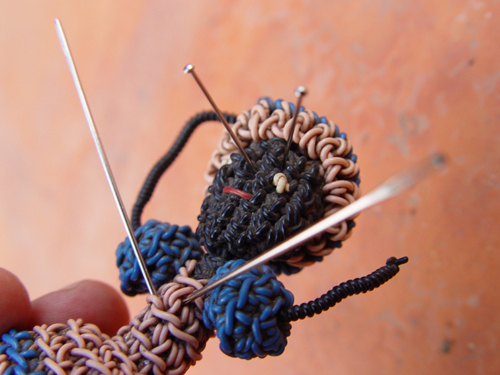 Day 2- This is also known as ‘Puno’. On this day Holika’s images are burnt and people even light bonfires to remember the story of Holika and Prahalad. Mothers with their babies take five rounds of the bon- fire in a clockwise direction to seek the blessing of the God of fire. Day 3- This day is known as ‘Parva’ and this is the last and final day of Holi celebrations. On this day colored powder and water is poured on each other. 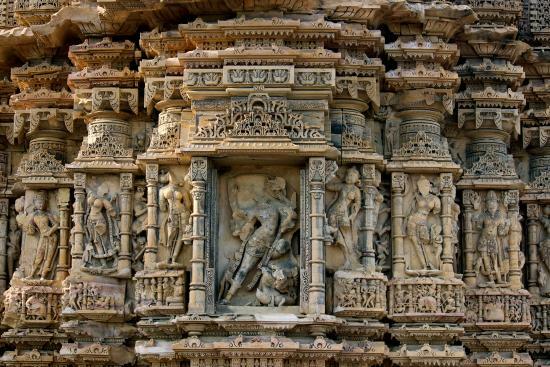 The deities of Radha and Krishna are worshipped and smeared with colors. In Assam, Holi is popularly called ‘Deol’ or “Phagwah”. In Manipur, Holi is celebrated along with their centuries-old festival of ‘Yaosang’ and it is celebrated for six days. In Vrindavan, Uttar Pradesh, Holi is populary known as “Braj Holi” The Holi festival is celebrated in the land of Braj bhoomi altogether for 15 days, right from the day after the Phalgun Amavasi.. In places like Mathura, Vrindavan, Nandgaon, Barsana, Goverdhan, Dauji and Baldev, the festival starts from the beginning of Basant Panchami. This season is known as Holika-ashtak. During this time, all other activities like weddings and family functions or sale and purchase of new properties etc. are put on hold. Every year, devotees & foreign tourists from all over the world visit the Braj region to play holi and are seen lost in a trance, forgetful of their dresses, disfigured with splashes of colors. Devotees are also seen singing Holi songs in pure Braj Bhasha (the classical language of the land). This year Lath-mar Holi celebrates on 24th February 2018 in Barsana, and on 25th February 2018 at Nandgaon. Holika Dahan is on 1st March 2018 and actual Holi celebration is on 2nd March 2018 across India. I am sure you all have heard many stories about PatalLok. 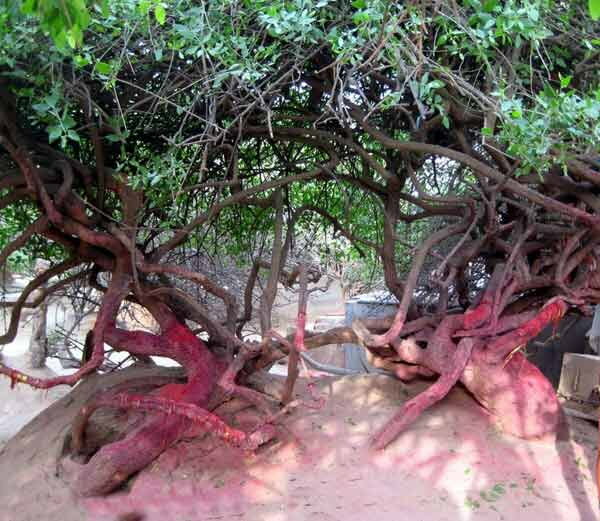 PatalLok a place where Danav, Daitya (Demons) & Naga lives as per Hindu Vedic Mythology. Now what if we tell you PatalLok still exists? Yes there is a place in Chindwara district of Madhya Pradesh, PatalKot is known for the entry to PatalLok (Gate to enter patallok). Patalkot name comes from Sanskrit word "Patal" that means “very deep” and “Kot” means “a place to live.” There is a belief that after worshiping 'Lord Shiva', Prince Megnath(son of Ravana) had gone to PatalLok through this place only. People say that Kings ruled this place in the 18th and 19th Centuries and that there was a long tunnel connecting this place to Pachmarhi in Hoshangabad district. Traditionally, the site is believed to be the entrance to PatalLok and discovered just few years back.. Also this the same place from where Lord Hanumana entered PatalLok to save Rama and Lakshmana from Ahiravana (King of PatalLok and Ravana brother) when Ahiravana (also known as Mahi Ravana) kidnapped Rama and Lakshmana. Madhya Pradesh is known for its forest treasures and Patalkot is one of its best nature’s gifts with great geographical and scenic beauty situated in the hilly block of Tamia of Chindwara district. Patalkot is a lovely landscape located at a depth of 1200-1500 feet in a valley. 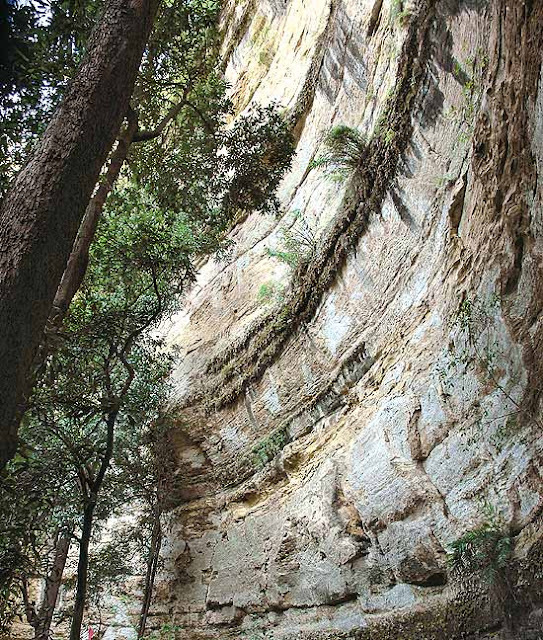 Because of the great depth at which it is located this place is christened as Patalkot. When one looks down the place sitting at the top of the valley, the place looks like a Horse Shoe in shape and it’s just 70Kms from Chindwara. Doodhi River that bifurcates the valley is the primary water source of the region. 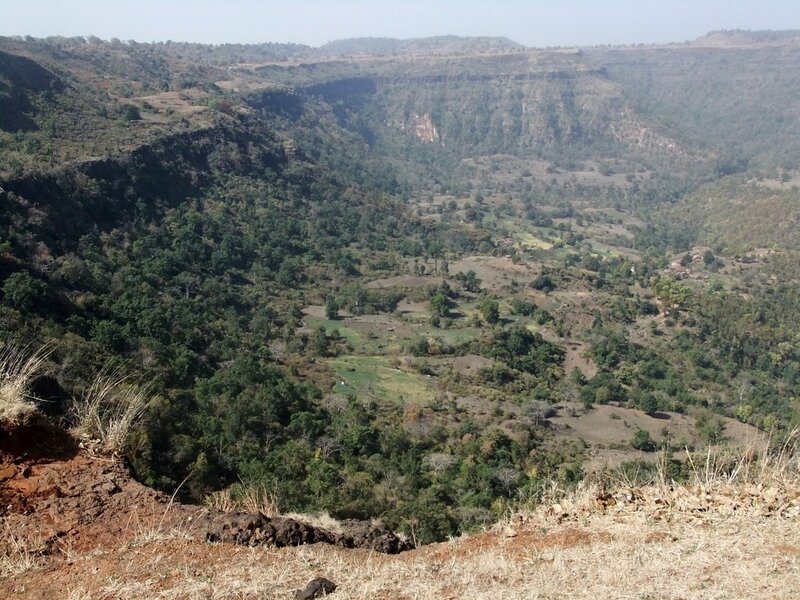 Patalkot valley is spread over an area of 79 km2. As soon as the clock strikes 4 pm, the village transforms into darkness, no sunlight reaches the depth of the mystical valley of Patalkot after few hours past noon. There are 12 villages & 13 hamlets in this valley, with total population of 2012 (1017 males and 995 females). Most of the people belong to ‘Bharia’ or ‘Gond’ tribes. The main villages of the valley are: Rated, Chimtipur, GujjaDongri, SahraPachgol, Harra-ka-Char, Sukhabhand, Dhurnimalni, Jhiram, PalaniGaildubba, Ghatlinga, Gudichattri, Gaildubba, Kareyam, Ghana, etc. These villages are located at the distance of 2-3 km each. The tribal dwelling in this untouched land, live harmoniously and are gradually uplifting their lifestyle, however they are totally cut off from the current civilized world. 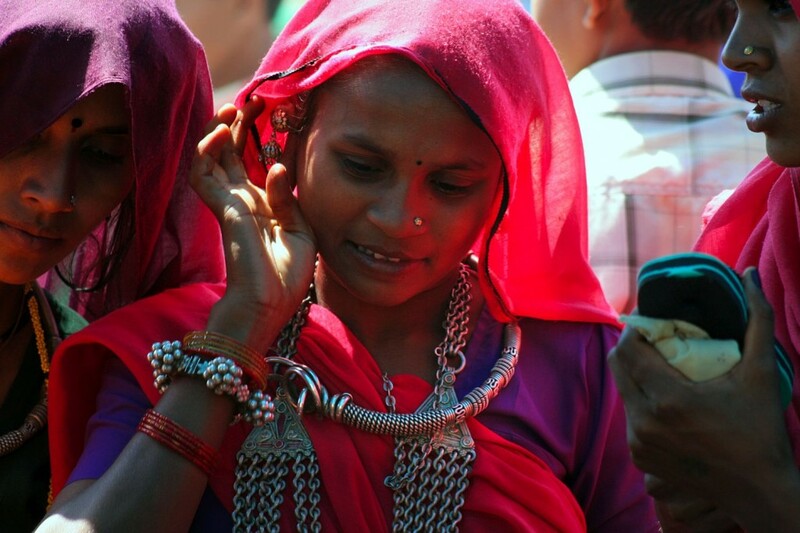 Gond and Bharia are the two main tribal communities out of those 45 living in the Madhya Pradesh and Chattisgarh state. It is said that Bharias are living here for more than 500 years and mainly constituted above 80% of the population and Gond tribe about 20%. Till a few decades ago, the tribes living here were totally disconnected from the outside world because of the difficult terrain leading up to the valley, and the dense forests sprawling across. 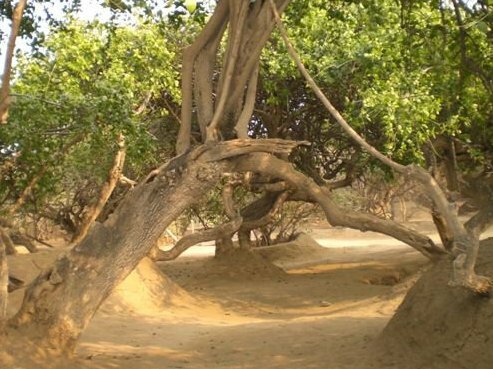 Because of this disconnectedness and seclusion, the Bharias and Gonds established a close friendship, and dependence with the ‘sacred’ forests around them. This valley is covered with tropical forests, which are supposed to be rich in biodiversity. Hundreds of economically important medicinal plants are found in abundance and endemic & rare flora is also found in this valley. When you visit this mystical Patalkot, you can see wall paintings and slogans painted on the walls, along the way to the valley that highlights the importance of eco-system and conservation of nature. It is truly a good way to spread the awareness. This valley is known as a treasure of medicinal plants. 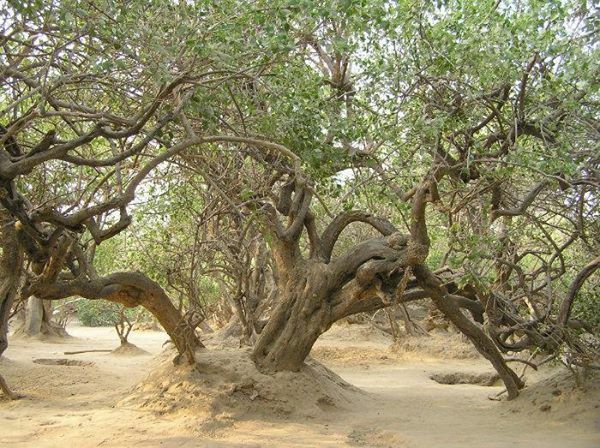 According Madhya Pradesh VigyanSabha (MPVS), which is working in the area for past 10-12 years more than 300 varieties of medicinal plants has been identified in the area. The tribal of Patalkot are skilled in using the forest plants to make effective medicines. Herbal healers locally known as Bhumka are real knowledge bank. They utilize medicinal plants that are grown in the valley. 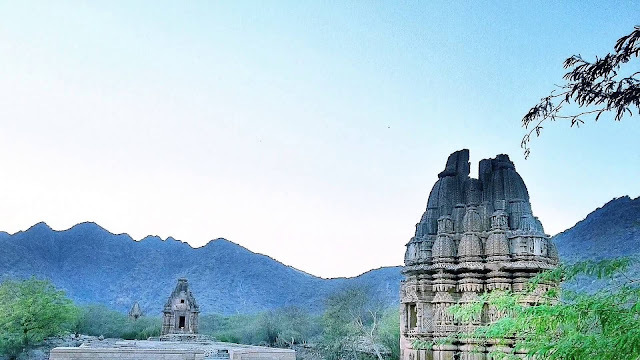 There exist several mythological beliefs and traditional narratives that connect the origins of Patalkot to Mahadeo hills – a sacred site for Lord Shiva. Chota Mahadeo peak near Tamia an offshoot of Mahadeo hills surrounding Pachmarhi (the only hill station in MP on a plateau) is situated in the vicinity of the valley. 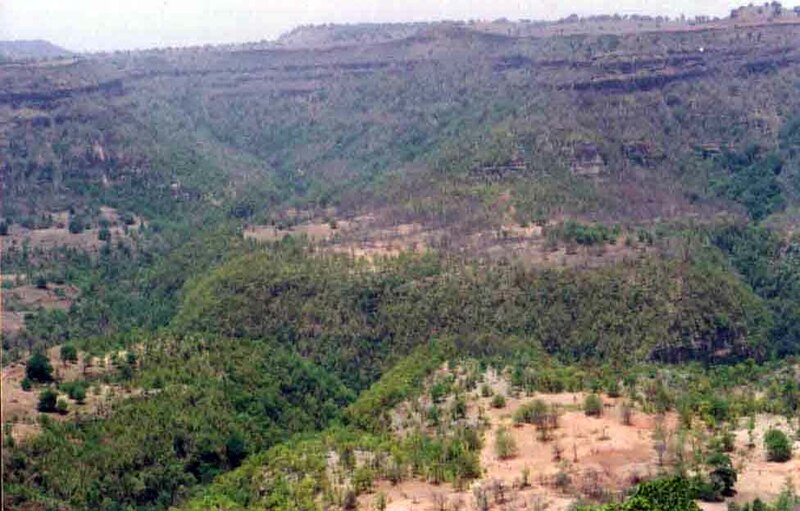 According to locals, the deep gorge in Patalkot is owing to the mythical journeys of Shiva in the ‘Tapovan’ of this valley. The people here believes that patalkot is the only entrance to patal-lok and they are the protector or watchman of the patal-lok. 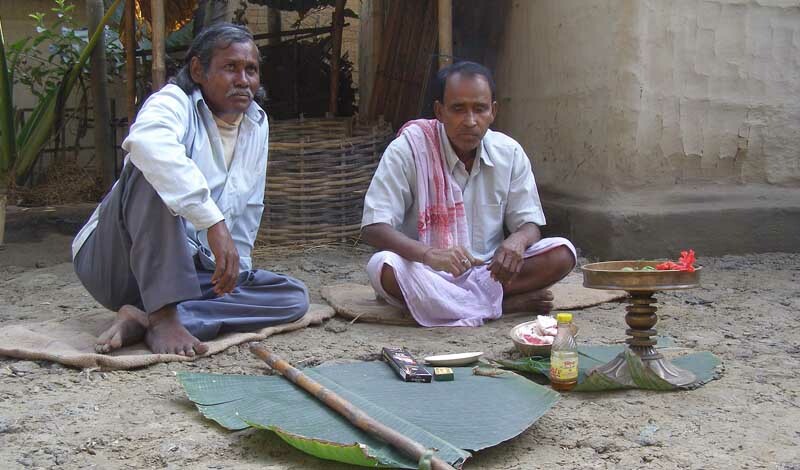 Tribals perform prayers and rituals everyday. The place, they perform Pooja (prayer) is called as Devghar. Tribals worship Mahadev, Badadev, Madai, Madmi Mai, Dhuladev, Nandia, Surjadev, Agiadev as their gods and goddesses. Nagda, Timki, Shehnai, Chakule, Singa, Tambura, Chikara, Bansuri, Ghunghru, Khadtaal, Madar, Dhol, Dahak and Tudiya are common instruments they play in various ceremonies and rituals. Meghnath is one the most important fair of the valley. 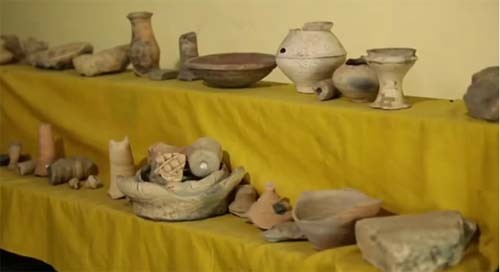 This fair is celebrated on Chait Purnima (According to Hindu calendar, full moon night in March or April, depending upon the position of planet system). On this occasion, tribals make a wish and encircle on a big pillar. 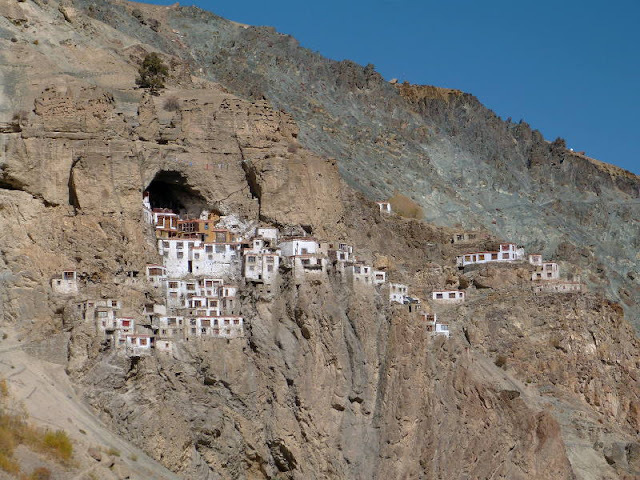 The place where Meghnath is worshipped is predestined and it is said to be a holy place in the village. The best time to visit this beautiful valley is during monsoons, as it is sheltered, with clouds all around. Best time to visit inside the valley: October to February. Best time to view the valley from top: July to September. Patalkot is located in the hilly region of Tamia tehsil. 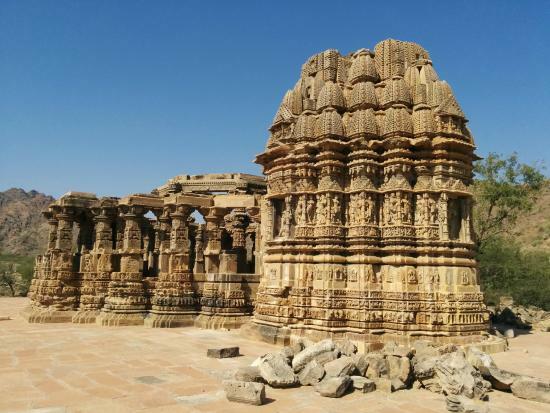 It is around 78-80 kms away from Chindwara in Madhya Pradesh. 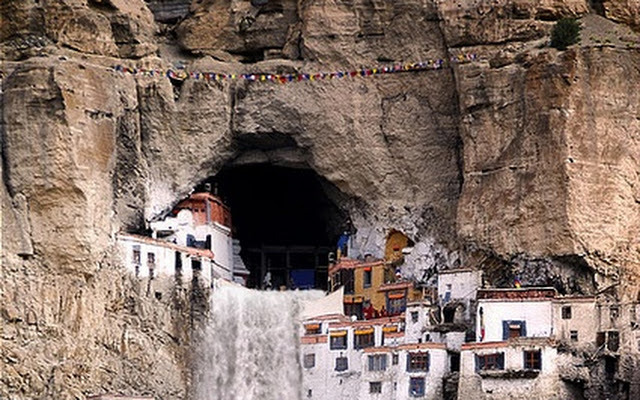 The best way to reach the valley via Chindwara is through taxi or hiring a car. Jabalpur,Bhopal & Nagpur are the nearest Airports around Chindwara. From Bhopal/ Jabalpur broad gauge trains are available right up to Chindwara Station. After arriving Nagpur by broad gauge rail route, (only meter gauge trains (Choti Line trains) are available between Nagpur and Chindwara), one will have to make the necessary change of trains to reach Chindwara. Chindwara can be approached by road from Nagpur (distance 125 kms. ), Jabalpur (distance 215 kms.) or Bhopal (distance 286 kms.). Taxis and buses are also readily available from these cities connecting Chindwara town. There is no facility of accommodation in the valley; the nearest accommodation facility is in Tamia at the forest or PWD guest house. Patalkot is a good place for tourism of M.P. If you want to experience real experience or want to see tribal living, you can set your tents in the valley and enjoy camping.